NATURAL HABITAT AND PREFERRED SITE: Bald cypress is native to the Pineywoods, Gulf Prairies and Marshes, Pots Oak Savannah, Rio Grande Plains and Edward’s Plateau. It will adapt to a wide range of soils from sandy to heavy clays. Depending on the seed source, it may not grow well in black and white and other alkaline soils. See PROBLEMS below for more details. IDENTIFICATION INFORMATION: Bald cypress is a deciduous conifer that grows in a dramatic upright form, usually a strong central stem, pyramidal when young but spreading with age. Foliage is light green, lacy in texture and has reddish-brown fall color. The branching structure is layered and distinctive. Root “knees” appear especially in wet soil. FLOWERS AND FRUIT: 3 to 5 inch male cones March through April in drooping clusters, few female cones at branch tips in the spring. Fruits are wrinkled, rounded cones about one inch maturing in the fall. BARK: Gray to light reddish brown, fibrous, shallow furrows and broad flat ridges. FOLIAGE: Leaves are alternate, small ½ to ¾ inch, pointed at the tip, light green in summer with reddish-brown fall color. The leaves of pond cypress don’t open and stay folded to form a filament effect. 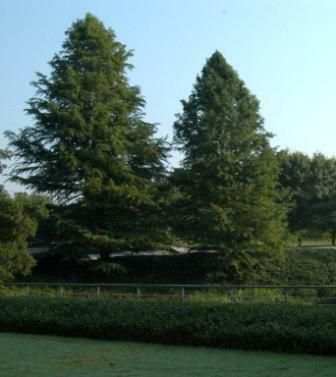 CULTURE: All of the bald cypress trees are easy to grow in a wide range of soil. They can grow in wet soil or in water but can also do well in normal garden soil and moisture. Some growers have found bald cypress to be quite drought tolerant. Medium growth rate under moderate to little fertilization. PROBLEMS: Chlorosis (mineral deficiency) can be an issue when this tree is planted on top of white limestone rock in shallow soils. 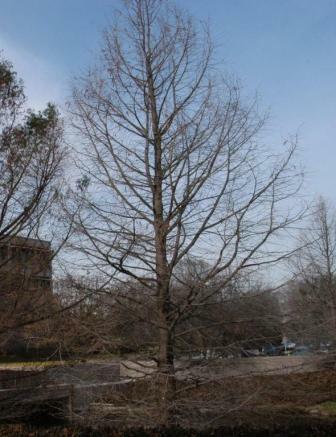 Bald cypress trees propagated from trees growing in acid soil conditions will struggle in alkaline soils. This same tree propagated from trees growing in alkaline conditions will grow well in most any soil. The difference is why you see beautifully healthy bald cypresses in Texas and other high pH soils and other bald cypress trees that are yellow, sick and not growing. Crown gall, spider mites, and bagworms will also attack these stressed trees. The Basic Organic Program will deter these pests, but the only long term solution is to purchase bald cypress that are bred to be happy in high pH, alkaline soils. It’s the responsibility of the growers. It’s buyer beware for home owners and developers. PROPAGATION: Primarily by seed. Collect the seeds in late September when the cones have turned brown but haven’t shattered. Before sowing, soak the seeds in a 1% vinegar solution or in water just under the boiling point. Some books recommend a 1% lye solution. Bad idea. Garrett Juice would be the best treatment. 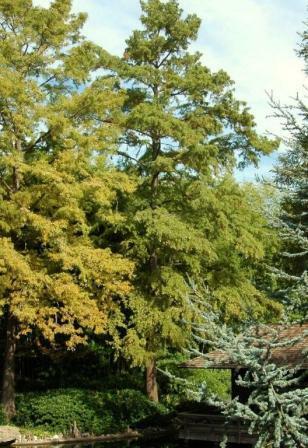 INSIGHT: Montezuma cypress comes out earlier than this tree in the spring and holds its foliage longer in the fall. It also seems to be more salt tolerant. This is Pine Ridge Lake near Pittsburg Texas where I learned to ski. My Dad pulled us around in a circle with a small fishing boat.